My theme - Origins of Science Fiction Terms and More! The term, its meaning (definitions from Technovelgy), and first book appearance / a movie that features this term / a blogger buddy who reminds me of that term. A replacement for a damaged eye. This first appeared in Roger Zelazy’s Changeling, published in 1980. And the perfect example of that is found in Star Trek Generations. (Or any Next Gen Star Trek movie or show.) Released in 1994, this was the film that merged the original series with Next Generation, thus passing the baton to a new crew. It featured LeVar Burton as Lt. Commander Geordi La Forge, a man without sight but able to see with the use of a VISOR that connects directly to his brain. Generations starred Patrick Stewart, William Shatner, Johnathan Frakes, Brent Spiner, Malcolm McDowell, and the rest of the Next Gen crew. You want to meet someone who views the world a little differently? Gail from At The Farm is a creative, no-nonsense, animal-loving, and faithful individual. If you have a damaged view on the world, she will set you straight. An entirely separate realm or universe that exists along with our own; it may be wildly different or vary from ours by only a tiny degree. No surprise – this first appeared in H.G. Well’s novel, Men Like Gods, in 1923. There are many movies about parallel universes. (And the IWSG anthology, Parallels: Felix Was Here, is all about them!) One that weaves the worlds tight is Looper, a science fiction thriller about a man who kills those the mob sends back in time – until they send an older version of himself. That’s when the parallel worlds come into play – can you change the future or the past? And if you can, is it really a parallel world? Starring Joseph Gordon-Levitt, Bruce Willis, and Emily Blunt, Looper came out in 2012. Author J.H. Moncrieff just might give you that parallel universe. Want to see beyond the ordinary? Want to know the weird and strange that is in the world? Then JH is your gal. Power generation through photon fission. This didn’t originate with a book story, but from the video game Alpha Centauri by Sid Meier. Published by Fraxis Games in 1999, this game was a ‘sequel’ to Meier’s Civilization. The best example of quantum power is found in 2015’s Ant-Man. Marvel’s smallest superhero battled a man bent on selling technology to the highest bidder in this hilarious and excellent film. Starring Paul Rudd, Michael Douglas, Evangeline Lilly, Corey Stoll, Bobby Cannavale, and Michael Peña, Ant-Man not only has a sequel in the works, but he appears in Captain America: Civil War. Quantum power is what fuels Ann at so much to choose from. She tackles so many topics, only that could explain her energy source! The ray gun has been used in hundreds of movies, so I decided to pick a unique one – Farscape: The Peacekeeper Wars. Technically a two-part miniseries, this film came out over a year after the series ended and was intended to wrap up the cliffhanger and tie up loose ends. The key regular characters returned, played by Ben Browder, Claudia Black, Anthony Simcoe, Gigi Edgley, and Wayne Pygram. Heather R. Holden from Welcome to the Edge owns a ray gun and more! This uber-talented artist shoots from the hip and she will zap you with her amazing web comics. Shuttles as we know them appeared in 1950 in Theodore Sturgeon’s short story, Stars are Styx, later released as a novel, The Stars are the Styx. Like ray guns, shuttles have appeared in many films. One was used in the 2000 film Space Cowboys to get the men up to a Russian satellite to fix it. The movie itself is cheesy fun and features the talents of Clint Eastwood, Tommy Lee Jones, Donald Southerland, James Garner, and James Cromwell. Birgit at BB Creations is that shuttle. She will transport you to a time of simpler movies and dazzle you with her incredible homemade cards. No surprises here! It appeared first in The Time Machine by H.G. Wells in 1895. Time machines come in all forms. A very interesting one appears in the 1981 movie Time Bandits. A group of dwarves use a special map to locate time holes and travel in search of treasure they can steal. From director Terry Gilliam, it’s a quirky and fun film starring John Cleese, Sean Connery, Shelley Duvall, Katherine Helmond, Ian Holm, Michael Palin, David Rappaport, Kenny Baker, and David Warner. Fundy Blue at Standing Into Danger is the ultimate time machine. She will take you back many years to a time and place of harsh living and survival. The journey down this time trek will enthrall you. Can you think of any other instances of optic prosthesis? Excited about the upcoming IWSG anthology? Fan of Ant-Man? Did you watch Farscape back in the day? Fan of Terry Gilliam movies? Following those awesome bloggers or picking up some new books? And have you learned anything on this science fiction journey…? Unfortunately, I will be gone Wednesday through Friday for training. (Really glad I’m doing A to Z Lite.) Since I will only have a couple hours each night, I’ve decided it would be easier to just respond to comments, check emails, and continue to maintain the A to Z Challenge list. Hope everyone understands. Will miss you guys! Catch you Saturday. Hi Alex - quite understand you ... I still don't know how you manage - must be zillions of little Alex's around ... enjoy that training. Wonderful topics for your "O to T" letters. Excellent post Alex. Don't work too hard. I couldn't believe I was number one. A Parallel Universe and time travel are quite possible in the dreamscape. I have read many articles about the ability to travel different realms in our dreams. Of course these make great topics for movies and books. I have visited Fundy's blog always interesting at her place. Enjoy your time off, Alex! Alex, this is a fun way to view the challenge. With time machine I can't help but think of the one I consider a classic - 1960 The Time Machine with Rod Taylor. Hope training goes well and you have fun. I LOVE Time Bandits! That is one movie I don't own that I really should. Thanks for reminding me! I remember that optic visor from when my husband was watching the show. Cool tool! Wonder if the Terminator movies would be considered parallel? Hope the training goes well. You're still doing a lot with this challenge! My first memory of parallel worlds is The Talisman--a Stephen King/Peter Straub collaboration that I really love. Also love time travel stuff. And thanks for the Parallels mention!!! I always thought ray guns looked cool and made fun sounds. Give me one of those and a time machine, and I could have an epic adventure! Already a fan of JH's! And I remember Space Cowboys - it was a fun movie. I have always found the concept of a parallel universe to be extremely exciting and intriguing. I grew up watching sci-fi movies and TV shows in which ray guns were used to zap the enemy. My big brother took me to see the 1960 film adaptation of The Time Machine starring Rod Taylor and co-starring Yvette Mimieux, one of the "it" girls of the period. I sometimes think I live in parallel universes. It would explain the strange occurences that seem to follow me about :) I enjoyed Looper. Thanks for sharing the amazing post. I like this post very much. Sandra, just wish it wasn't for training. Marcy, you need to pick it up then. Elizabeth, I'm sure they would. Although it did all come to pass. Shady, I wasn't around in time to see it in the theater. I am looking forward to reading Felix was here. Congrats to all authors with the new releases. Enjoy the training, and the time off! Geordie's VISOR looked exactly like a style of hair clip popular at the time. I guess they figured no one would know because GIRLS don't watch science fiction. Wouldn't it be awesome if someone invented a visor or some other tool to help people who are blind or have limited vision see better? We can only hope someone takes this idea and runs with it. A to Z Lite is a respite from your heavy schedule, Hank is all for it. Sci-fi terms this time around seem all too familiar, Quantum power,Ray Gun, Shuttle and Time Machine. To think they've been around for a long time! Hope the training is fun! Birgit is a shuttle of fun wisdom. Never learned so much about ole time quality cinema. Where would I go in a Time Machine? not sure if I'm very adventurous. I'm thinking Roaring 20s Paris.....that could be quite fantastic. Ray Guns are old school sci-fi. And Parallel universes are cool. This is a good batch of terms. Have a great week! I hope your trip for training is fun! I have one deaf ear, I'd love to look into improving my hearing but everything just costs so much! If it was my sight though, I'd think I'd do just about anything to get the latest technology! I remember Farscape. One of my favorite sci-fi shows. Hopefully, you're getting training on how to build a teleportation device or create clones to manage all of the blogging related things you do. I remember laughing so hard at that ridiculous optic prosthesis LaVar Burton wore because it looked exactly like those crazy hair novelties from the 80's called a banana clip. I like the AtoZ lite! I think we should all do this and then go to Ft. Lauderdale for a party! What's so interesting about these terms is how long they've been use. I love Ant Man, but I'm a big fan of Paul Rudd. I thought he was excellently cast. On Blu-Ray, the 3D is quite impressive. Star Trek TNG's finale was a great example of a Parallel Universe. I still haven't seen Ant Man, but I really want to... Of course, it's on a rather long list of not-seen movies! Be careful while you're gone. We'll miss you, but we understand that your time is limited. Where is a clone when you need one??? Great mentions of books and bloggers. Bam. Bamberg. Bamberg in the burg. Nissa, surprised my wife never noticed that. Karen, I just hope it won't be soul-crushing. Robin, I'm sure they will all skip the training. AND they destroyed the Enterprise in Generations! Like they did in The Search for Spock. And, apparently, like they're going to do again. Ant Man was great indeed. I actually knew Time travel was pretty old. Space cowboys was cheesy fun indeed. I liked Looper until the end, same stupid ending as The Butterfly Effect pretty much. Ever since that movie seems like that ending has been used 50 times over. Thanks for the shout, ugg to training. I watched Ant-Man when my brother and I visited our parents in South Carolina in December. I don't normally watch many modern films (besides foreign films, historical dramas, and documentaries), though I thought this one was enjoyable. My brother was rather amused when I initially thought the guy playing Ant-Man was Adam Sandler. I use parallel universes. They vary slightly, but it's those slight variations that cause so much turmoil. O.P. also made an appearance in Season 2 of animated series Star Wars Rebels. Plus I believe there might be someone else in need of this come Season 3. I really need to watch Looper. Lazer Tag Academy is another animated series and it used ray guns very well. Time Machines can be used in so many ways in fiction. I just might try A to Z Lite next year Alex. Great topics. Parallel universe is always so intriguing and so hard to get right. I think it's hard not to have a flaw or two. I enjoyed Looper though. I think it is so awesome you chose this theme. You're clarifying a lot of terms I always wondered about, but was too afraid to ask in public. Thanks for that. I really enjoyed Ant-Man. I was pleasantly surprised. I I remember the character Geordi La Forge from Star-Trek. It would be nice if that technology can be available for the visually impaired today. All the best with your training. Thanks so much for the shout out, Alex! You made my day. You are seriously the kindest guy EVER. I'm surprised that Optical Prosthesis wasn't used earlier than it did. That really surprised me, probably because my uncle had a glass eye and I remember being fascinated by it. I would love to be able to travel in a time machine. I'd probably go backwards, to experience different eras. Parallel Universes intrigue me and the whole quantum physics arena baffles me. So cool how you find the first uses of these terms. Great stuff! Completely understand. How you keep up with everything generally, I have no idea. I thought quantum power was much older than that! I mean the concept. We talked about fission in physics classes in the early '90s. Time Bandits... That movie went over my head completely. Made no sense. I just saw Looper last month, neat movie! It's amazing that time machines go all the way back to the 1800s, and we're still writing about them! Have fun on your training! Omg...I am pleasantly surprised that you gave me a shout-out and I thank you:) I love Terry Gilliam and I love Time Bandits high I think is a brilliant movie. I still have to see Ant Man and will because too many people have said good things about it. Star Trek, I think, used all of these in their shows especially the Shuttle in Voyager. Have a safe trip and a good time off at work, I guess, until Saturday. Like Hilary: I believe you must have thousands of little Alex clones darting about doing all you do! I have fun with my own parallel worlds. Pace yourself! I think in future generations we'll see regenerated body parts making optic prosthetics -or any prosthetic - obsolete. I liked Star Trek Next Generation much better than the original. I also loved Ant Man. I just saw it last week. It'll be interesting to see how they follow it up in the planned sequels. I'm a fan of parallel universes and time machines (alas, neither has been proven yet. . . That movie Time Bandits was fun to watch. Kristin, your cover is awesome! Carrie-Anne, God no! That would've been horrible. Murees, glad you're getting something out of this. JH, you're welcome! And thanks. I saw a hilarious take off on the blues brothers featuring Geordi and Data, with Geordi commenting about wearing a visor instead of sunglasses. Hope you have a great training!!! You were pretty smart to do A to Z Lite. I love JH's blog! She always has such interesting topics. The battle scenes in Ant-Man just made me laugh, like Yoda leaping about with a light saber but returning to plodding around with his cane when the fighting is over. I just realized how similar this is to my thing from a few years ago where I talked about sci-fi things that had become actual things. Hope your training went well! I liked many of the examples you brought up--Farscape, Ant-Man, Star Trek... So many different aspects I didn't really think about. Wow, I had no idea ray guns were a hundred years old! Why don't we have any real ray guns yet? Science should really get on that. Training, huh? We'll miss your comments! Definitely excited by the anthology. Congratulations to all those with new releases. And thank you for the work you put into these posts. I am so impressed by both the research and by the thoughtful way you link to other bloggers. You really are a one man support system. Nice to see Birgit mentioned, she is virtually a neighbour of mine. I didn't see any of these movies but I have read the H.G. Wells stories. He,like Isaac Asimov, wrote about things which have since come to pass. A subject which fascinates me. Well done Pat Hat, your selling your Worange for Orange through and through on Amazon for all to find! If only I could do that!!!! Through the Garden Gate by Patsy Collins!!!! Hey that sounds super great!!!! I bet everyone is double proud of you, Patsy! I like stories about time travel. The idea that one person can make a tiny choice to change their fate and the fates of others both thrills and scares me. I do know a few of those bloggers but I'll have to check out the others! Good luck with your training! JE, they should get on that! Cynthia, it is a scary thought. John, I couldn't have done it otherwise. Thanks so much for the mention of my new publication. Good luck with the training! I love Ant-Man. Only watched a little bit of Farscape. It just never caught me. I think we'll have optic prosthetics someday soon. I'm disappointed that it doesn't appear Michael Pena will be in the next Ant Man movie. He wasn't being billed last I checked, anyway. How cool to have a time machine. One can dream. Enjoyed learning the origin of the presented words! What could I do with a time machine? Man oh man. I don't think I would change anything just re-live some of those wonderful moments over and over again! Now, I would have picked the TARDIS for an example of time machine, but that's just me. ;) Looper is a movie I remember wanting to see in theaters, but then never did. I really should rent it one day. I totally thought of LeVar Burton when you mentioned the optic prosthesis. Cool stuff! Good luck at your training. Excellent walk through some fun, sci-fi stand-outs! I enjoyed Farscape when it came out. I think I've learned that I might know more about sci-fi than I thought I knew . . . but don't ask me any trivia questions . . . The play I saw on Friday and reviewed is called Constellations. It's about multiverses, the many outcomes of action, reaction, and choices we make. Well, I'm surprised the idea for replacing a damaged eye didn't appear earlier than 1980. Seems like it should have been around much longer. In fact, wouldn't Tleilaxu eyes in Dune count? There are days I could use a ray gun and a time machine. Hope the training goes well! LeVar Burton! Such a cool dude. Cyclops from X-Men totally ripped off his visor. Or was it the other way around?? Time Travel and Parallel Universes are some of my favorite plot devices. Sometimes I feel like I'm living in a parallel universe. I missed Ant-Man but keep hearing about how funny it is--and humor is always my favorite element, so I'll catch it soon. H.G. Wells really was brilliant. I once saw a bio on him which explained how he was the son of servants on an estate, and the enlightened estate owner let the boy have full access to his huge library. I like how that kindness has benefited us all by helping to turn Wells into a great writer. H. G. Wells was full of great science fiction ideas, so I'm not surprised to see his name. I have learned some new terms from your posts, and it's interesting how many of them have been around for a long time. Thank you for dropping by my humble little blog and saying hi! I'm loving your collection of books. :) Enjoy your week, Alex! Parallel universe is an amazing concept that I love. I'm enjoying your A to Z lite. A-Z is fun. I see a couple of things/people I know here, and a couple I'm about to search out on Google. :) Good luck with your training! I hope all goes well. Well, I'm back from vacation. I have a lot of catching up to do. Wow, you've got a lot of great stuff here. I loved playing Alpha Centarui. I thought the Ant-Man film looks cool, but I have not seen it yet. I love Farscape and was sad to see it go. But it had a full run so I am happy with that, and they did tie it up fairly nicely. I remember watching Time Bandits back in the day. Lot's of fun. What a crazy film. I'm back on ninja duties tonight. Sorry for the absence. Thanks for stopping by and blitzing me! Definitely agree with Birgit being a shuttle; she is amazing with her knowledge of films! Another great roundup for the challenge! Cool tid bits. I'm liking this A to Z Lite. It reminds me that it is better to keep things short. The concept of parallel universes has always fascinated me. It would be so interesting to see what life is like in them. I loved the film, TIME BANDITS... it was sweet and creepy all at the same time... pun intended! So cool hearing about the first instances of SF things. Great covers on the new releases listed too. Have a great training session. 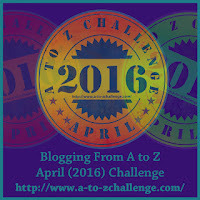 Alex -- your A to Z lite posts are great. On time travel--I felt like a time traveler while writing a historical novel. The time I spent in a prairie museum and reading books about the early 1800s in Illinois was quite an experience. I'm getting ready to do it again. Great topic, Alex. 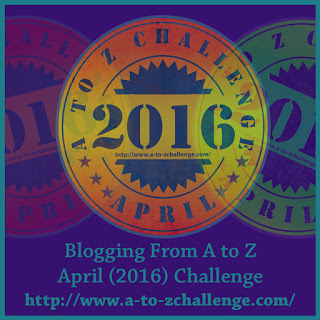 I'm checking out AtoZ posts this year, see if I might do it next year. So far, it looks fun! Oh, Alex! Thank you for the Time machine link! Sorry I'm just getting around this morning. I can't believe it, but I'm still fighting this horrible cold, and yesterday I just didn't make it to blogs. If I had one wish that could be granted, a selfish one for me only, I'd wish for a time machine!!! I am so enjoying this series; I'm going to mine it later for good movies to watch and books to read. Hope all is well with you, my friend! Back again to wish you a good training session! I hope that you have a chance to learn some cool and useable things! Take care of yourself, and may you have a little down time to relax during that training! Off subject, but I'm looking at the new covers and thinking those authors put everything they could into those books and must be feeling very excited right about now. We see so many new covers, we forget the work that had to have gone in to creating them. I just want to take a moment to cheer for them all. Bravo! Wouldn't an Optic Prosthesis be really wonderful for folks that are blind? Cherie, and that was cool! Ian, not sure, never read it. Karen, I want a ray gun mounted on the hood of my car. Helena, that was generous of them. Sandra, better than eye surgery, which is scary. I am honored. Thank you, Alex! I noticed I'm two down from a damaged eye...teasing! Space Cowboys! Time Bandits! Farscape! Just got my dose of nostalgia. My brain is on overload with all these new terms. Looks like I need to find out more about these topics. Interesting post. Didn't Seven of Nine have a false eye too? I'm a huge fan of parallel universes in fiction - there are so many possibilities! time bandits! My fav movie! Ant-Man was delightfully funny. Time-Bandits, another classic favorite! Thinking about rigging my Subaru with quantum power next time I'm in cue for an oil change. I also need a time machine--let's get a kickstarter going for one of those. Congrats to all the new releases!! So that's what they're called. Optic Prosthesis. I liked Lt. Commander Geordi La Forge but will sometimes refer to him as the guy with the thing over his eyes when I couldn't remember the character's name. Watched Loopers but didn't enjoy it as much as my husband. My favorite tv show about parallel universes was Sliders. Loved Ant-Man and can't wait for Avengers: Civil War. Has there been news that there'll be Ant-Man 2? Never watched Farscape, but I knew that the actors playing Vala and Lt. Colonel Cameron Mitchell in Stargate SG-1 used to be on Farscape. I thought Ant Man was going to be ridiculous, but it was a good movie! Patsy, you're welcome! She had a Borg implant around her eye I believe. Samantha, I'd donate to that. Lidy, yes! There will be a sequel - Ant-Man and Wasp-Woman. I think this post tipped your hand. I've long suspected you own a time machine. It's the only explanation for your super power of commenting on so many blogs. Parallel universe is a theory that is both intriguing and frightening! Could this be a reality? I can't believe I've somehow missed the At the Farm blog! I know I will love Gail and am looking forward to following that one. Usually I already know your recommendations so it was fun to discover a new blog right off the gate in this post. Hope the A-Z Lite is working well for you! Great tie-ins to books and movies! I have to see Ant Man, since you said it was so funny. I loved Space Cowboys - great premise and awesome actors! It's great to see shout-outs to awesome bloggers like JH, Heather and Birgit, and to learn about new ones I didn't know before. Ah, Ant-Man, still one of my favorite Marvel movies. And yet had you told me 5 years ago that Paul Rudd was a viable superhero I would have laughed at you. I've always wanted a ray gun. Not sure about an X-ray gun. I can do without seeing my opponents naked. I still haven't seen Ant Man. That's one I really wanted to see in theaters too! Big fan of Farscape until the writers started taking acid later on! Hope you're enjoying the training, Alex! Lots of new covers to feast on! I'm such a sucker for great covers! Space Cowboys... Grrrreat movie. Clint is the coolest astronaut ever. Beam me up Scottie I'm having a terrible day! Space Shuttle what a great idea if we had one to go to all the different planets... well, heck! Maybe one day we will and we'll be going to the different planets for vacation. ~snicker~ Whatcha think? Isn't HG Wells just awesome? Hope you are having a good training week! All I can say is that the family is breathlessly awaiting the arrival of Captain America: Civil War. What else is there? Wow, I never expected to be mentioned in one of your A-to-Z posts. Thanks so much for the shout-out! "damaged view on the world ..."
As for Ant Man, I thought they missed an opportunity to be funnier. Looper was a really great surprise. Such a smart story. I have had the pleasure to read an ARC of Parallels: Felix Was Here and it is a great anthology. I appreciate Space Cowboys because it is an excellent example that films do not always need young heroes. If I could travel in time I would like to visit Victorian London and I would like to travel with the Hindenburg before she was destroyed in 1937. Hope you enjoyed your training. If I could travel in time there are several places I would like to go visit. Julie, glad I could lead you to someone new. Brandon and Bryan, I would've laughed as well. That film was a pleasant surprise. Ken, we'll see it soon! A 1916 movie with ray guns? I want to see that! All I can think about is Rocket from GoTG saying, "I need that guy's eye!" I haven't seen Looper, but it did look interesting. Ant Man was great! So much fun when the actors love what they're doing. I haven't seen Time Bandits in a million years! Best of luck on all the new releases! All I can hear is Rocket from GoTG say, "I need that guy's eye!" I've never seen Looper but it does look interesting. Ant Man was great. So much fun when the actors love what they're doing. Jeremy did a fantastic job with the T-shirt! I really enjoyed Ant Man. I watched it with my better half, he was super excited. I thought the idea of him shrinking and being a super hero would be very weird, but actually they pulled it off well in my opinion. wow, photon fission... I want to know more about that ! Is Parallel's coming out in Ebook?